Liz Helms founded and developed the program AHEAD With Horses Inc in 1968. She was the Executive Director from its inception till her passing in March 2012. “We taught thousands of students, and along the line we came across handicapped children,” said Liz remembering their first – a boy with shallow hip sockets who required hip surgery every year. “It was really his father, a heart surgeon, who decided that the program would maximize the effect of the surgery”. The articulation of the hip joint kept his sockets functioning longer. He did so well that he required less and less surgery and ultimately went to Arabia to ride real Arabian horses. Using the techniques that she had learned, Liz began working with more severely handicapped children developing individualized programs to meet each student’s needs. Liz believed that it is the horse’s movement that changes the brain, which in turn changes the body and the individual’s ability to integrate and process sensory input. The program is predicated on the belief that everyone can learn and achieve. She explained that the children have fun and experience a sense of success while facing real challenges. 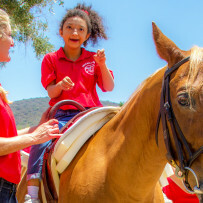 Today, AHEAD With Horses serves hundreds of children each year. The first handicapped student was served 48 years ago and more than 100,000 have been served since that time. The youngest, 2 weeks old, the oldest 81. The program has been recognized educationally, scientifically, nationally and internationally. Its work has been presented at prestigious forums and major conferences including Grand Rounds at Children’s Hospital of Los Angeles, Council for Exceptional Children (state conference), National Autism Conferences and the Olympic Scientific Congress (just to name a few). AWH children have performed in demonstrations including the XXIIIrd Olympiad, Tournament of Roses, Del Mar National Horse Show, Vaulting Fests, L.A. County Fair and so many more! The program has been featured on national and international television, radio and print media. One of the highlights of AWH’s history was President and Mrs. Ronald Reagan’s attendance at Fun Day ’92, presenting two of their personal horses to be used as therapy horses in the program and achievement award medals to more that 150 program participants residing in all areas of Los Angeles including housing projects. To top it all off, AWH was honored to host Councilman Wach’s Second District Leadership Luncheon with special guest Mayor Richard Riordan. Other AWH projects include PROJECT M.O.V.E. (Motivation, Opportunity, Values, Ethics) AHEAD meeting the social and developmental needs of disadvantaged/poverty level children, at-risk-youth and gang youth; and PROJECT MOUNTAINS AHEAD, an innovative mulit-sensory nature trail and learning center. There have been so many exciting memories over the programs history… The most important however, are the memories of the children. Each week, so many children make progress…some big and some ever so small. Whether it is a child taking his first steps, another sitting for just a moment longer or just a smile from a “non-responsive” child…this is the real history of AHEAD With Horses. These are the gifts that last a lifetime. The success of AHEAD With Horses is best summed up in the words of a parent. “With this program, we have the hope for our son to be the best he can be…Isn’t that what we all want for our children?